I was chatting to Mr. Morehead, eminent editor of Plastic Warrior magazine and all things related a while back, well; about a year ago? 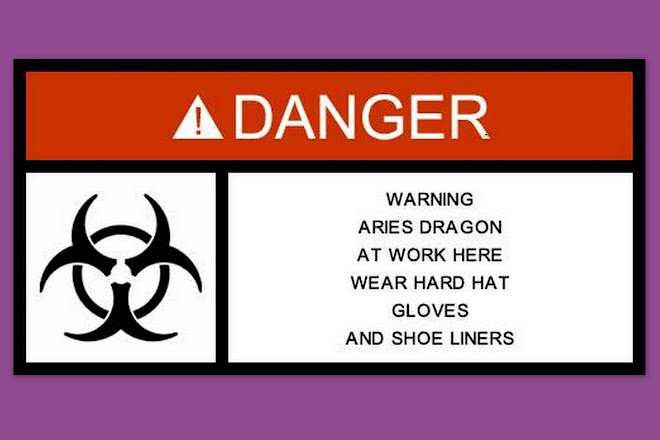 Anyway, we were discussing the known unknowns and the unknown unknowns, when he mentioned rumors of Charbens having done - or been said [by a friend of a friend of a man who comes up to you at a show, type of thing!] to have done - cake decorations? Given the numbers of small scale odd-&-sods I've picked-up over the years, I thought I'd throw the contenders up here by way of listing those which are more, or less likely to have been Charbens' cake decorations. This post looks at the less likely candidates. Plastic versions of the imported lead solids known to the Hollow-cast collection community to have been carried by BOTH Johillco and Charbens? The standing lady was found in the US, the others (I have a few more; tatty ones) over here. 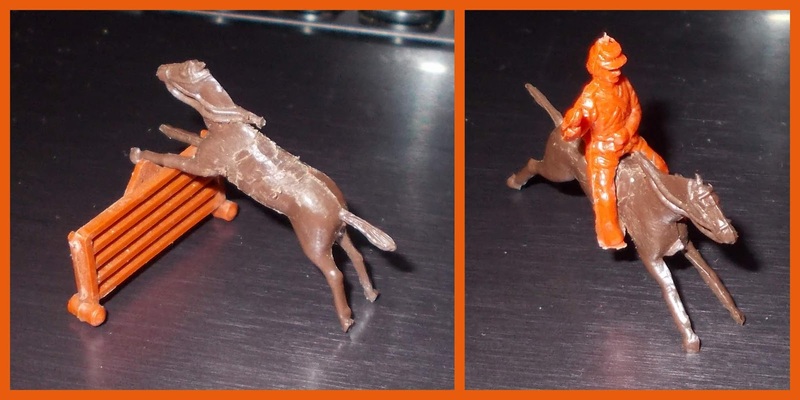 I have never seen or found riders, galloping horses, dogs or a fox from the metal set in plastic (but that doesn't mean they weren't produced), and while there is an obvious connection with Charbens, there is an equal connection with Hill, who also used some wishy-washy brown plastics? Indeed my money is on Hilco, as the plastic (under the paint) is the glossier plastic used by Hill, not the chalkier-stuff one associates with Charbens. The figures won't stand-up without being anchored with icing, lemon curd, strawberry fondant or something, so they were almost certainly cake decorations though - but they could just as easily have come from the same (believed German) source as the metal originals? 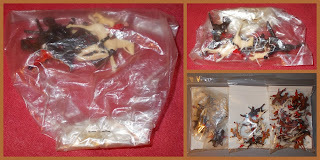 Do you have other items from the set in plastic? The previous set are firmly in the 35mm camp, but these have gone down a gear and are HO/OO-gauge compatible, also, they are technically Britains! Actually plastic versions of the old lead-solid Lilliput/Dublo hunting set. With both Charbens and Hill having some poses of questionable origin in their repertoire it could be either of them again, however, while the later (? ), commoner ones (lower image) are in the same glossy plastics (more colours though), there are an earlier tranche with chalky plastic (upper image), so worth a punt on Charbens this time. 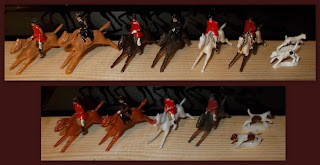 The quality of the mouldings suggests these were produced from Britains original moulds, and as such, rather leaves Britains also in the frame, knocking them out as an unbranded side-line? The packets look very much like other early Culpitt's or Gem, but equally are the sort of thing that fitted in the 'prize-chamber' of a Christmas cracker, but they often turn-up like this in multiples, so I prefer/fancy old baker's stock over crackers? You get a woman riding side-saddle, two guys one in a top-hat and one in a riding hat, two (identical) dogs and a farm gate 'jump' per bag, which is a simple, open-ended polythene bag, stapled shut in a vague arrow-head. Bottom-right image is the sample I'm working from, that's 41-years of picking the stuff up! I used to be amazed that Hong Kong (pale one to the right) had copied something so esoteric as the fence/gate, but then it dawned on me they had probably copied the lead original! As I don't even think the fox was issued - it's one thing to have a cheerful, colourful hunt on a cake; it's quite another to have a hunted animal on a cake! - here is the Britains Lilliput original. Because I keep one of everything, including OBE's, I have this one which someone has gone to some lengths to strip the figure from, Airfix Federal Artillery seem to fit just fine!